We've been enjoying having Yuki Numata in town for rehearsals for the Second Fall Slee Sinfonietta concert on Tuesday, October, 30, at 7:30 p.m. Wildly praised by the New York Times as a violinist with “virtuosic flair and dexterous bravery,” Numata is rapidly gaining attention as a charistmatic virtuoso, having performed frequently as a soloist with our own Slee Sinfonietta, the New World Symphony, the Wordless Music Orchestra, the Tanglewood Music Center Orchestra and the Eastman Philharmonia Orchestra. Numata was recently invited to perform Charles Wuorinen’s Rhapsody with the Tanglewood Orchestra, and, at the composer’s request and as a last minute replacement, she performed Wuorinen’s Spin Five with The Slee Sinfonietta. “Yuki has an avid interest in new music and as a result, has had the opportunity to work closely with some of today’s foremost composers. These include Charles Wuorinen, Steve Reich and John Zorn. At the Tanglewood Music Center, Ms. Numata was invited to be a New Fromm Player, focusing specifically on the performance of contemporary chamber music repertoire. Yuki holds a great deal of respect for composers of her own generation and has collaborated with many of them including Jeff Myers, Caleb Burhans, Nico Muhly, Andrew Norman and Timothy Andres. 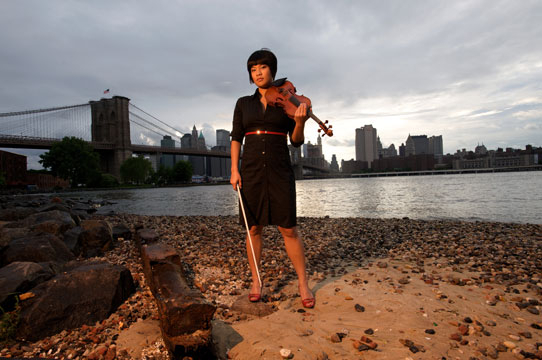 “Additionally, Yuki is an active freelancer and has performed with the American Contemporary Music Ensemble (ACME), the String Orchestra of New York City (SONYC), Alarm Will Sound, Signal, East Coast Chamber Orchestra (ECCO) and counter)induction. In true New York freelancer style, she wears many hats and has played and/or recorded for bands and artists including Passion Pit, The National, Grizzly Bear, Jóhann Jóhannsson and Max Richter. Yuki was a featured soloist on the Duncan Theater’s 2009-2010 season and has appeared at numerous summer festivals including Music in the Vineyards, Tanglewood, Music Academy of the West and The Banff Centre. Come see Yuki Numata perform with visiting hornist Adam Unsworth, UB pianist and New York Philharmonic pianist-in-residence Eric Huebner, and the rest of the Slee Sinfonietta this Tuesday at 7:30 p.m.